Returning to work after giving birth isn't an easy feat, particularly if you're a grand slam tennis champion. But Serena Williams' husband had a plan, and it involved four billboards. 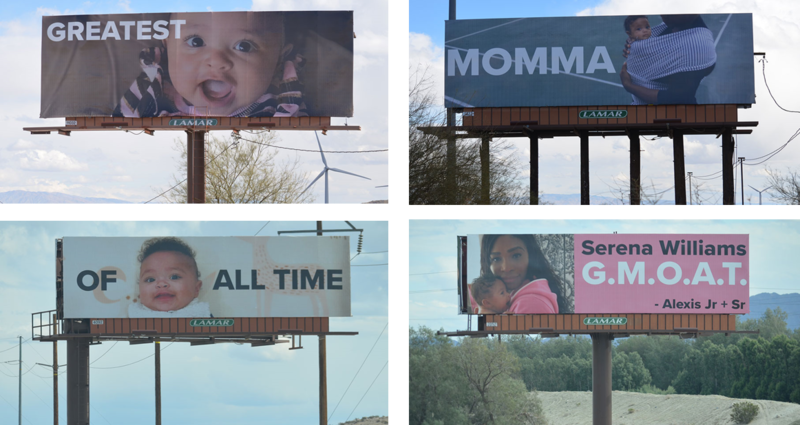 In March, Williams will compete at Indian Wells -- the first time she's played an official singles match since the 2017 Australian Open -- so husband and Reddit co-founder Alexis Ohanian has installed four giant images of their daughter Alexis Olympia Ohanian Jr. with the caption "Greatest momma of all time" along a major road leading into the Californian city. "These just went up on alongside I-10 into Palm Springs," Ohanian wrote on Twitter and Instagram. "@OlympiaOhanian & I wanted to welcome her back to tennis. Designed them myself, with some help from Jr. #GMOAT"
"Literally am crying," the tennis star wrote in reply to Ohanian on Instagram. "This is so sweet. I love you." In January, the 23-time grand slam winner returned to the court at the Mubadala World Tennis Championship in Abu Dhabi, less than four months after becoming a Mom, but playing that tournament gave Williams pause for thought and she opted not to play at the Australian Open. Williams had played in the 2017 Australian Open -- and won -- while pregnant. She hasn't shied away from the difficulties she's experienced since becoming a mother. She revealed in a CNN op-ed that she "almost died after giving birth", but on top of her medical ordeal, new motherhood temporarily overwhelmed her. "No one talks about the low moments," Williams told Vogue in January. "(The) incredible letdown every time you hear the baby cry ... Or I'll get angry about the crying, then sad about being angry, and then guilty, like, 'Why do I feel so sad when I have a beautiful baby?' The emotions are insane." Lamar Advertising Company (Nasdaq: LAMR), a leading owner and operator of outdoor advertising and logo sign displays, announces the Company’s operating results for the fourth quarter and year ended December 31, 2017. Lamar Advertising Company (Nasdaq: LAMR), a leading owner and operator of outdoor advertising and logo sign displays, announces that its board of directors has declared a quarterly cash dividend of $0.91 per share payable on March 29, 2018 to stockholders of record of Lamar’s Class A common stock and Class B common stock on March 19, 2018.